Wood as a natural building material has been in use for centuries, and over time, much has been learned about the techniques that are necessary to have wood maintain both its beauty and its durability. The most important requirement for most wood products is that “green” or fresh cut wood must be dried before it can be used effectively. Drying makes end dimensions more predictable and the wood easier to work with. Drying also increases wood’s strength properties, allows it to bond more fully with adhesives, and even lowers the overall weight for shipping, storing and handling. Over-drying, on the other hand, can lead to splits, cracks, warps, and other defects that can affect the machining, the safety factor, the value, and the appearance of the wood. For any wood product or project, there is an optimal moisture balance that allows the wood to be machined well, function well, and maintain its natural beauty. The catch is that that balance cannot be predicted with any rule-of-thumb or chart. It depends on a number of factors unique to each location. Wood, like many natural substances, is considered a hygroscopic material–it naturally absorbs and releases moisture (as water vapor) from and into the air around it. When green lumber is dried, the cellular pathways that served to transport water from the ground to the leaves of the tree remain in place like tiny tunnels through the wood that is only too ready to take in additional moisture when the air around it has high humidity, or release it into drier air. Therefore, the amount of moisture any particular wood stock or wood product is holding is entirely dependent on the ambient conditions (a combination of relative humidity (RH) and temperature) of the air around it. 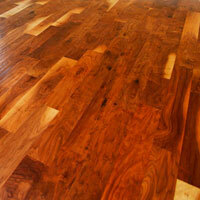 If the humidity is high, the wood will take in moisture; if the environment is very dry, it will release moisture. In uncontrolled environments, these changes can represent potentially damaging conditions for wood as its natural interaction with its environment can mean rapid or extreme shifts in the wood’s moisture content (MC). As wood absorbs or releases water vapor from the air around it, not only does its MC change but also so can its very dimensions. Cracks, splitting, finish failures, warping, cupping, crowning, gaps or adhesive failures can be a very real concern if changes are too drastic for the wood to gradually reach a balance with the humidity and temperature levels around it. In addition, different species will have different moisture change tolerances based on their own structural make-ups. All wood must be allowed to come to a state of balance with its environment in order to prevent moisture-related damage. This state of balance is called equilibrium moisture content, or EMC. Equilibrium is necessary for wood flooring, or indeed any wood product or furniture, to be at an MC level that is balanced with the humidity and temperature of the air around it. How can you help the flooring reach equilibrium? 1. Schedule delivery after the job site is at service conditions. Even proximity to undried plaster or masonry can temporarily impact the MC of wood flooring. Be sure the wood flooring is allowed to come to complete equilibrium with the job site’s conditions before installing, and ideally, only installing when the space is at service conditions. 2. Be sure subfloors are adequately dry. 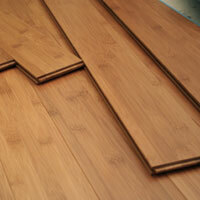 Especially in new construction, subfloors can still hold significant levels of moisture. Concrete should be at the specified RH level (relative humidity testing is the best way to accurately measure concrete moisture levels), and wood subfloors should be tested with an accurate wood moisture meter to be sure the wood flooring and the subfloor have similar MC levels. If they are not, more time is necessary to allow for equilibrium to be reached. You may also have the option of utilizing an appropriate moisture mitigation product (like vapor barriers) prior to installing the wood flooring. After delivery, packaged flooring should be opened and separated as much as possible to allow airflow to reach all pieces and encourage equilibration throughout the load. Take an initial reading with an accurate wood moisture meter to help determine how the MC levels are changing over the next hours and days. 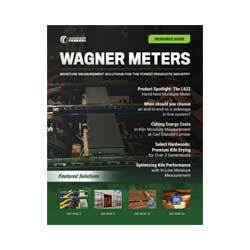 The Wagner Meters line of pinless wood moisture meters lets you easily take multiple readings that can be repeated as often as necessary with no damage to the flooring surface. Accurate installation is also part of maintaining a wood floor’s long-lasting beauty, and once the flooring MC has settled into balance with the job site, you can proceed with confidence. The finish will also help to seal the wood from surface moisture movement, but be sure to leave accurate maintenance advice with your customers so they can be aware of changes that might indicate a problem from external moisture sources. Even in a relatively stable environment, wood is still subject to seasonal movement as humidity levels and temperatures change with the weather. Controlled indoor environments with functioning heating and air conditioning can help minimize these changes, but they still can present small changes – the door that sticks in winter, small gaps between floorboards in summer. Allowing the wood flooring to reach equilibrium before installation and verifying the wood’s MC with an accurate wood moisture meter are the best ways to ensure the balance and harmony that EMC can bring to a beautifully satisfying and durable wood floor.